Back in the pre-digital era, you couldn't just buy whatever song you wanted whenever you wanted. And so, for a single that'd already been released to become available again, there had to be a pretty good reason. Usually, it was because the song hadn't been a hit the first time around and so the record company were trying their luck a second (or, in some cases, third) time. Sometimes, it was because the song was used in a TV commercial or movie, and public demand warranted a re-release. On one occasion in 1983, a sporting event resulted in a former number 1 single returning to record stores - and the top 10. Its chart comeback occurred in the same week as another homegrown chart-topper arrived on the ARIA top 50. The current number 1 single this week in 1983 was "Australiana" by Austen Tayshus, which spent its seventh week in what was become an increasingly tiresome run at the top. When would the jokes wear thin? Italian dance act Club House (best known in Australia for 1994's "Light My Fire") created a mash-up of Steely Dan's "Do It Again" and "Billie Jean" by Michael Jackson, and had a hit with it across Europe. Then, American group Slingshot stole the idea. They'd kicked off their previous album with number 12 hit "One Perfect Day", but Aussie pop/rock band Little Heroes weren't so successful with the title track of their third LP. Things were moving in the wrong direction for Uncanny X-Men. Debut EP Pakistan reached number 40 on the albums chart and follow-up single "How Do You Get Your Kicks?" got to number 51. Things would improve in 1984. I'm assuming this was another America's Cup-related release, but I can't find out anything about it - other than the fact it was available only on cassette. Drop me a line if you know more. Following the disco-pop of "She Works Hard For The Money", Donna Summer shifted gear (and chart fortunes) with this reggae follow-up featuring Musical Youth. JoBoxers' UK number 3 debut single, "Boxerbeat", hadn't taken off in Australia, but the British group rectified that with follow-up "Just Got Lucky". A cross between Madness and Dexy's Midnight Runners, the band couldn't have sounded more British if they'd tried - which makes it all the more interesting that lead singer Dig Wayne was actually American. This was the band's one and only ARIA hit. After starting her music career with four top 10 singles in Australia, Kim Wilde hit a major speed bump with stand-alone release "Child Come Away", which had bombed out at number 76 at the start of the year. The jazzy "Love Blonde" went some way to rectifying that situation by returning her to the top 50, but its number 32 peak still fell short of her glory days a couple of years earlier. Unfortunately for Kim, it was a brief respite from the chart doldrums, with nothing else from either the Catch As Catch Can album or her next release, Teases And Dares, coming anywhere near the top 50. That was despite Teases And Dares featuring excellent singles like "The Second Time", "The Touch" and "Rage To Love". It would take until 1986 for Kim to get things back on track - and we'll see her do that shortly on my 30 Years Ago... posts. She'd scored one of the biggest - and longest-running - singles of the year with "Gloria" and another smash hit with follow-up "Solitaire", but for whatever reason, the Australian public decided they weren't interested in Laura Branigan: balladeer. At least, not yet. Originally earmarked for Air Supply, "How Am I Supposed To Live Without You" ended up with Laura instead, reaching number 12 in the US. In Australia, it climbed just one spot and wouldn't become a hit until its co-writer Michael Bolton decided to have a go at singing it himself in 1989. His version reached number 2 here in 1990. Laura would be back with an upbeat pop smash in 1984. From a song that would become a hit thanks to a cover version we move now to a band finally landing a big hit in Australia by recording a remake. UB40 had previously visited our top 50 with their debut single, "Food For Thought" ("King" doesn't seem to have been given double A-side status locally), which reached number 36 in 1980. But, none of the reggae band's nine subsequent releases (which included a live version of "Food For Thought") did anything locally. In the UK, their chart fortunes had been starting to flag a bit, too. Which brings us to this lead single from covers album Labour Of Love - a project so well-received that it ended up as a series. On the album, UB40 tackled 10 songs previously recorded by their musical inspirations. In the case of "Red Red Wine", it was the 1969 reggae version by Tony Tribe that they imitated rather than Neil Diamond's original from the previous year. UB40's take on the track gave them their first UK number 1 and almost did the same in Australia, kept from the top by Billy Joel's "Uptown Girl". In the US, "Red Red Wine" reached number 34 in 1983, but would eventually get to number 1 there in 1988 after it was re-released following the band's performance of it at the concert to celebrate Nelson Mandela's 70th birthday. Speaking of re-releases... Last week, we saw two chart entries linked to Australia's win in the America's Cup - and here's another. 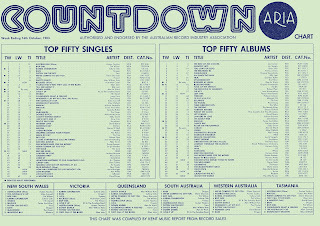 A six-week chart-topper in summer 1981-82, "Down Under" became the unofficial anthem of the efforts by the Australia II team to wrestle the yachting trophy away from the New York Yacht Club. It was the perfect song to associate with the sporting event, mostly because it had reached number 1 in the US earlier in 1983. That musical triumph was matched by the Perth Yacht Club's own win - and a sufficient number of people wanted to buy "Down Under" as part of the national celebrations. It didn't come close to matching the chart-topping peak of the original release, but it did return the song to the top 10 for a second time and add another 14 weeks to the single's top 100 tally, bringing it up to 35 weeks. The return of a chart-topping single might have been big news, but it wasn't the highest new entry on the top 50 this week in 1983. The latest release by Australian Crawl was - and it wasn't actually a single. By entering the chart at number 9, four-track EP Semantics provided Australian Crawl with something they'd never had before: a top 10 hit. They'd come close a couple of times - "Downhearted" had reached number 12 in 1980 and was followed by number 11 hit "Things Don't Seem", while Aussie rock classics like "The Boys Light Up" (number 22), "Errol" (number 18) and "Shut Down" (number 17) weren't too far behind. But thanks to the popularity of "Reckless (Don't Be So...)", Semantics burst straight into the top 10 and would go on to peak at number 1, the position reached by the band's last two albums. Besides topping the chart, "Reckless (Don't Be So...)" was significantly different from all those previous singles (and most of the band's other songs) in another way. Australian Crawl were generally known for crowd-pleasing pub rock anthems, but the downbeat track was a real change of pace for the band. Maybe that point of difference worked in its favour. 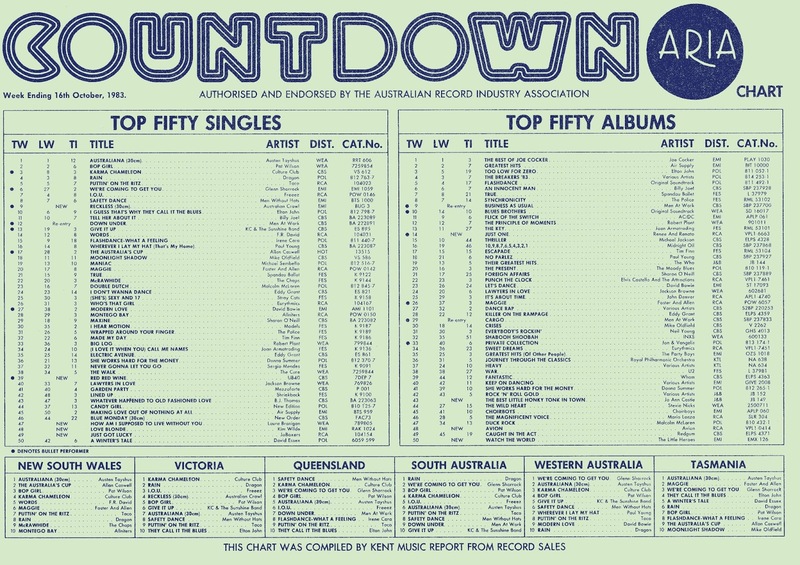 Having reached the chart zenith, the only way was down for Australian Crawl. And, as we saw in my posts covering 1985, their next studio album was an unqualified disaster, with the band deviating from their trademark sound a little too much. Next week: two of 1983's biggest love song duets, plus a new romantic band follows up their biggest single with a track that gets wheeled out every four years at Olympics time. I loved Kim Wilde's 'Love Blonde' at the time. They used to play the video as one of those fill-ins between shows on my local tv station, not just in 1983 but at least until 1986, when it was also part of a Kim Wilde triple play. I didn't know what she was singing, she's a love what? I guess the clue was in the title. It's a shame that Kim went through a lean time on the charts in Australia. 'The Second Time' deserved to at least chart. 'Red Red Wine' and 'Reckless' are deserved classics, though not very exciting these days due to overplay. 'Just Got Lucky' is a very catchy tune. I was unaware of Laura Branigan's version of 'How Am I Supposed To Live Without You' until after Michael Bolton's version. Laura is more my style usually, but I feel that Michael nailed it better, Laura's lacks a bit of oomph. I haven't heard the 'Australia Who' song either. It was one of the elusive songs I couldn't track down a few years back when I was attempting to hear every Australian hit. To be honest it's not one I'd pay for, more of a novelty I assume. Average singles from Donna Summer and Uncanny X-Men, who had (or would) fare better in the future, and The Little Heroes, who had probably peaked by now. Interesting that Slingshot "stole" the medley idea from Clubhouse. I first became aware of the Clubhouse track a few years ago, but still can't wrap my head around it being the same people (minus the featured singer) responsible for 'Light My Fire'. The Uncanny X-Men video is interesting to for the 1983 footage of Melbourne. I didn't hear 'Love Blonde' until getting Kim's (misleadingly-titled) 'The Singles Collection' album in '93. I bought her re-issued albums a few years ago, but have only gotten around to listening to them in recent months. The parent album is one of her best, though her 1984 'Teases & Dares' album is my favourite. I've uploaded a better copy of the 'Love Blonde' video here - https://www.youtube.com/watch?v=3qui2Ex3fzo . 'Red Red Wine' seemed to be everywhere in late '83. I'm sure I heard it shops, in the car, in restaurants and pubs. 'Down Under' was another ubiquitous song in the early 80's, and is a classic. Its top 10 peak upon being re-released less than 2 years later seems odd though. Surely everyone who liked the song already owned a copy by this point? 'Reckless' was another 80s classic. I liked the general sparseness of it; sometimes less is more. It seems strange though that this was the only Australian Crawl top 10 'single'. The Laura Branigan song was familiar from my high school friends' record collections - 2 of my friends were big Laura fans before I discovered her music in 1984. This song is OK, not my favourite of hers, though she sings it much better than its composer Michael Bolton does. I loved Laura's songs Solitaire, Satisfaction, Self Control, Ti Amo and of course Gloria! And, much later from 1993, her beautiful rendition of weepie ballad How Can I Help You Say Goodbye.